We've added some very helpful new features to middlespot that will improve your productivity: sync, notes and todos. You can now sync your desktop with your middlespot folder on your google drive. Tap the sync button under your desktop title and info box and any files or content you've added to your google desktop folder on drive will automatically be added and displayed on your desktop here. The content will be placed in the middle of your desktop for you to arrange where it makes most sense to you. Also, if you delete a file from your google drive desktop folder, it will be removed from your middlespot desktop as well. To sync your desktop with your drive desktop folder, just click the sync button. I always have a notebook on my desk to jot down stuff as I'm working throughout the day. I really wanted this on my middlespot desktop, somewhere I could have a list of notes and to do task easily accessible. So we built the notebook, a tool dedicated to your desktop. 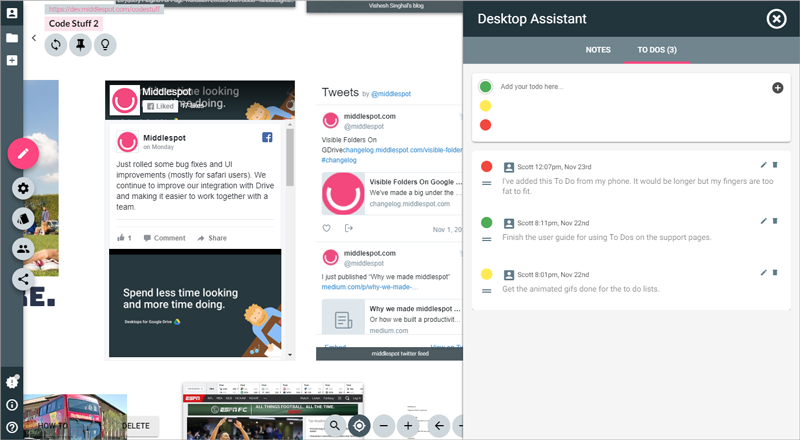 Notes gives you the ability to create, manage, order, and delete notes to yourself or for those who view your desktop. Only you, the owner, and contributors can add, manage, and delete notes to a desktop. When you add a new note, it appears at the top of your notes list. You can drag it around to rearrange it. To do lists are something that help me accomplish my job. It's another thing I like to have close by on my desk that I usually do with sticky notes. So we built a very simple and effective to do capability right into your middlespot desktop. Add a to do and give it a priority color code. The to do will appear at the top of your list of to dos. You can drag to rearrange it within your list of other to dos to also help manage your priorities. You can edit existing to dos to change what they say and their priority color and even rearrange the order. The number of to dos will always be indicated on the notebook button. On shared desktops, both notes and to dos are visible to anyone who has access to the desktop. This allows you to keep others aware of what you are working on and your thoughts around the content on your desktop. If you have added collaborators to your desktop, they can also add, edit, and delete notes and to dos on the desktop. We hope you enjoy these updates, they've been very fun to make and we use them daily here in the office ourselves.